Mr. Chairman, Excellencies, Members of the Working Party, Ladies and Gentlemen, good morning. Last September when I addressed Members of the Working Party on the Accession of The Bahamas to the World Trade Organization, I advised that after a six-year hiatus, the Government of The Bahamas had relaunched its efforts to become a member of this august body. Seven months later I am addressing you again; an indication of our commitment and focus in this process. This past week our negotiating team held bilaterals with several members of the Working Party. In those meetings we discussed the openness of the Bahamian economy, our Revised Goods and Services Offers, the limited levels of subsidies provided to our farming sector, and the execution of our foreign trade regime. On Wednesday evening while attending a function, a seasoned diplomat, quite familiar with The Bahamas’ circumstances, pointed out that when The Bahamas acts, it tends to do so deliberately. The same applies to these negotiations. We seek to be quite deliberate. 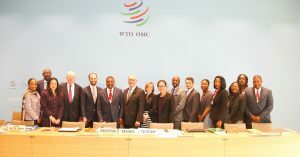 We seek to join the WTO because we believe that participating in the rules based global trading system makes sense for our economy. Participation affirms the importance of that system to the stability and growth of the world economy. We also however, seek to ensure that our membership provides continuing opportunities for our people to grow and prosper through meaningful participation in the ownership and prosperity of their economy. About these dual interest we are very deliberate. Our continuing dialogue with the Bahamian public, some of whom express anxieties about this accession process, we inform them about the value and benefits of this organization to global trade and prosperity. However, we also acknowledge that ours is an economy with certain vulnerabilities, sensitivities and economic development needs that must be taken into account in this accession process. The Bahamas is a developing country in every sense of the word; laden with the burden of providing for scattered populations over twenty nine inhabited islands, annually under threat from hurricanes, subject to the vagaries of global economic factors and highly vulnerable to the consequences of climate change. To read the statement in its entirety, click here.